Winter is in full swing around here which means we’ve got all sorts of cold weather animals on our minds. Carrigan has developed a new love for books about animals and visiting the zoo. 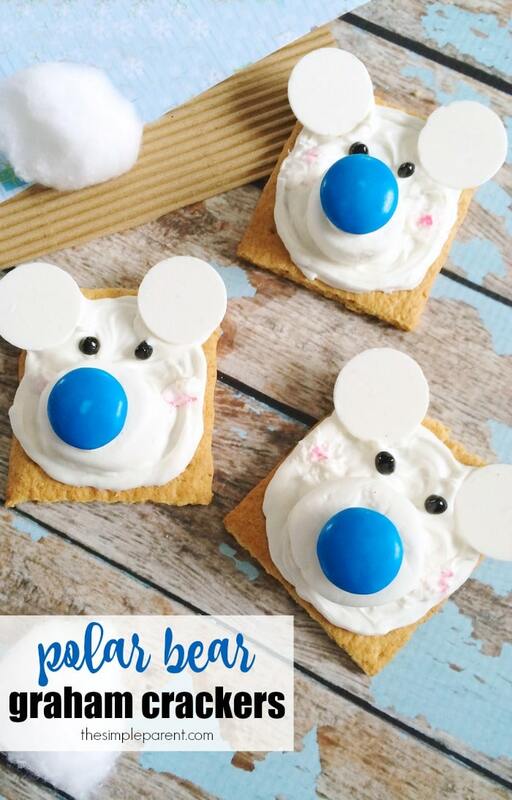 So these easy Polar Bear graham cracker squares were a super fun treat to make together! 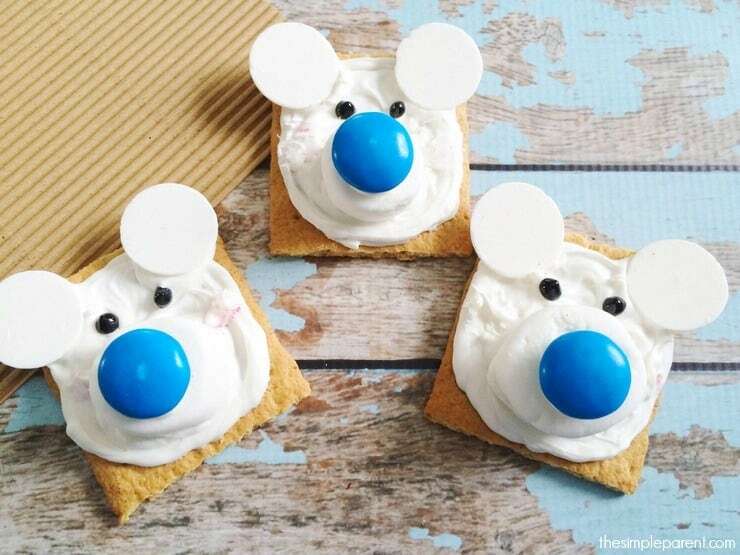 I’ve mentioned before that we’ve been having fun making graham cracker snacks so animals were an obvious next choice! We’ve included all of the directions for our polar bear graham cracker squares and a list of some of our favorite books about polar bears! I’ve also added some affiliate links in case you want to order anything to have your own polar bear day together! You’ll also need a decorating bag, a clean cotton swab, and a knife. Melt half of the white candy melts in a microwave safe bowl on 50% power for 2-3 minutes, stirring every 30 seconds. Pour the melted chocolate into the decorating bag (works best if you place the decorating bag inside a glass and fold the edges over the glass). You can also use a zippered sandwich bag and snip off a corner. 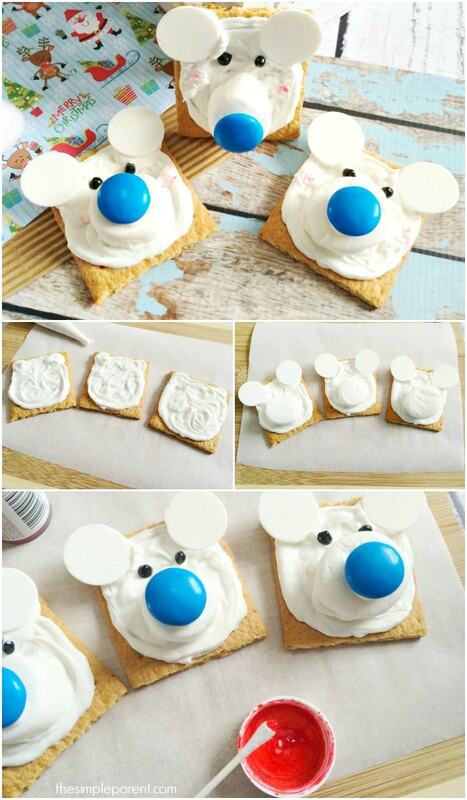 Cut the tip off the decorating bag and begin frosting a circle on your graham crackers, then add two circle ears on the top corners. Cut the marshmallows in half to make two circles, place one on the center of each frosted graham cracker. Place two unmelted white candy melts as ears in the top two corners. 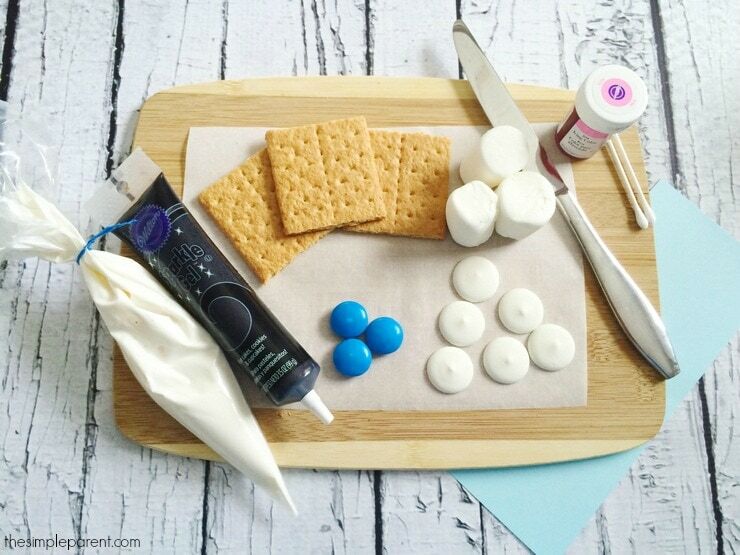 Place a tiny bit of melted white chocolate on the back of the blue mega M&Ms (as glue) and carefully press them on top of your marshmallow halves. With the black sparkle gel, draw polka dots for eyes on the polar bear (careful as the white chocolate will still be melty). These adorable little guys are almost too cute to eat!